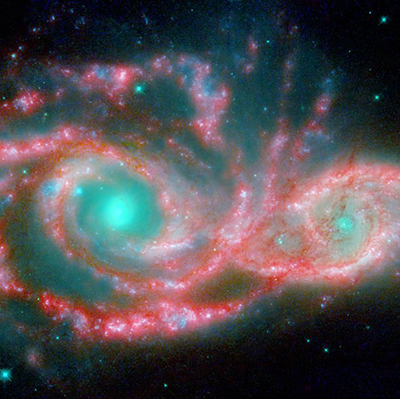 Here are a couple of tangled galaxies that look like, well, eyes in the sky. Why are they tangled? The accepted explanation is that they are on course to colliding with each other. Or maybe they were just created to look like eyes in the sky? The dancing galaxies are located 140 million light-years away from us, in the Canis Major constellation. The larger and more massive galaxy is labled as NGC 2207, and the smaller is IC 2163.